All seven extant marine turtle species are included on the International Union for the Conservation of Nature’s (IUCN) “Red List of Threatened Species” (IUCN 2010). The use of molecular genetic techniques plays a critical role in the understanding and management of global marine turtle populations (Bowen et al. 1997), supporting research in fundamental ecological concepts such as population structure, connectivity, historical population trends and phylogeography (Encalada et al. 1996; FitzSimmons et al. 1997a, 1997b; Dutton et al. 1999; Wallace et al. 2011). In turn, this information can be used to inform management (Waples 1991; Mortitz 1994). 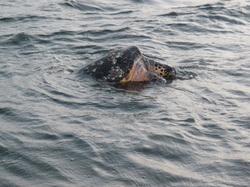 The hawksbill turtle (Eretmochelys imbricata) is one of only three species of marine turtle listed as Critically Endangered (CR; Mortimer & Donnelly 2008) by the IUCN; this classification coming as a result of populations having plummeted in many parts of the world (Meylan et al., 1999; Mortimer & Donnelly 2008). More specifically, hawksbill turtles inhabiting the eastern Pacific Ocean are considered one of the world’s most endangered marine turtle populations and until recently were considered functionally extirpated in the region (Gaos et al. 2010, 2012a; Wallace et al. 2011). The recent discovery of several nesting and foraging sites has provided new opportunities for research. Using both mitochondrial and nuclear DNA markers, via this project we are analyzing hawksbill nesting and foraging samples from throughout the eastern Pacific to understand genetic stock structure and connectivity. Previous research into the global phylogeography of the species has been forced to omit individuals inhabiting the eastern Pacific due to unavailability of samples, and generating information for this region is important from both a biological and management perspective, thus this is another important component of this project.